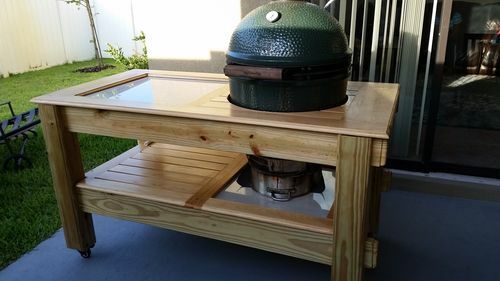 Project was a Large Green egg BBQ table built from cypress and SYP. This is my second table but I changed the design or the cypress top to remove a ceramic tile. The stain was requested by the customer and outdoor oil was used as a topcoat. I don’t think I have ever seen a BBQ table before. The table makes for a nice area for food preparation and staging. What is the square opening beneath the egg hole used for (stand for the egg?) I might have put on a larger set of wheels since it will be rolling around on outside terrain, but all and all, nice project. -- TheQueTip, Killeen Texas - All tools I've purchased from Harbor Freight eventually became a hammer. The Gren Egg is ceramic but for safety concern I designed the space below the circle to hold tile to disapate the heat. The charcoal is on fires in that area. I would hav liked bigger wheels also but I make it custom to the height of the user and bigger wheels would have prevented the shelf and table top height I needed. The table is on a covered patio with smooth concrete. This allowed for design and function.